It’s Sunday again, and that means a dual project mash up. Last week, I posted a project and a few people said they wished I’d shown the creation of the card in the video aswell as the locket. I’ve 100% heard you, and I promise you that I will be doing some more creating in my Sunday projects, but I wanted to let you know that I had filmed this card at the same time as last weeks, and given that my office has been half in the kitchen and half in my bedroom all week while we have new flooring put down, there was no chance of filming another project. But please know, I will always listen when you talk or ask. Anyway, so my project today is all about the ovals. It’s very much the monochrome with all that Basic Black and just a mere hint of Whisper White in the Itty Bitty Accent Flowers. 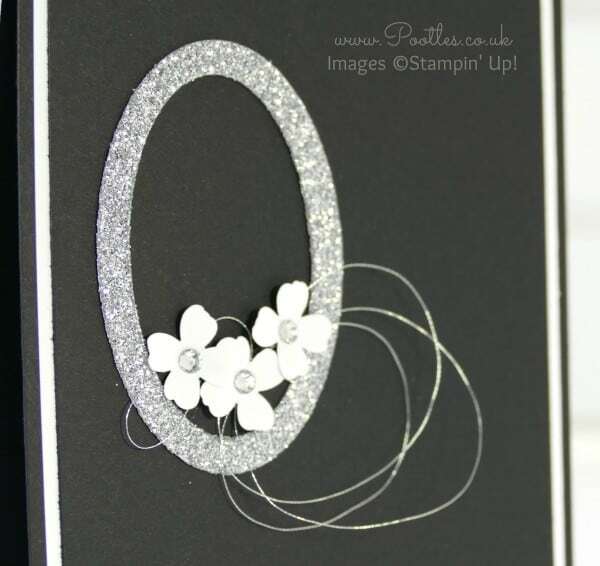 I love stark and stylish, and with the Silver Glimmer Paper Ovals and the tiny Hello taken from the Greetings Thinlits, I’m rather happy with it. I wonder how it would look in Night of Navy or Elegant Eggplant….? And of course, the link to my South Hill Designs blog is here for you, so that you can see the locket in more detail! I love your monochromatic cards. Would you consider doing a series on it?